Weir (1992) provides a fascinating review of estimates of US unemployment levels before official US government statistics began to be gathered in 1940. Lebergott’s Manpower in Economic Growth: The American Record since 1800 (1964) is the major study that tried to estimate unemployment in the 19th century and until the 1930s, but has been criticised on a number of grounds. In particular, Romer (1986) alleged that Lebergott’s method introduced a spurious volatility in his unemployment estimates. Weir (1992) outlines these criticisms and reviews Lebergott’s work. Weir’s overall findings are that (1) Lebergott’s data had considerably less spurious volatility than Romer thought, and (2) there has been an impressive stabilisation of US unemployment since 1945. Weir (1992: 302, 322) agrees with Darby (1976) that Lebergott’s estimates of unemployment in the 1930s are inflated by the fact that government relief workers in this period (many of whom had a type of full time work) were classified as unemployed. Therefore Darby’s (1976) revision of Lebergott’s unemployment estimates is justified. Moreover, Weir also argues that Lebergott’s (1964: 182) use of Frickey’s index of manufacturing employment for his estimates from 1890 to 1900 resulted in an overestimation of unemployment for these years (Weir 1992: 319). 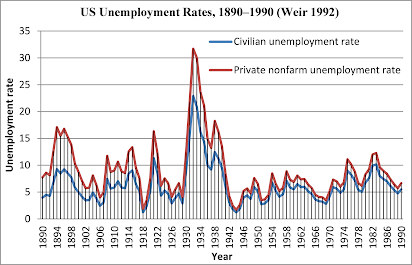 Although Weir’s revised estimates for the 1890s are lower than Lebergott’s, nevertheless Weir’s figures confirm that unemployment was protracted and high in the 1890s. A graph of these unemployment rates from 1890 to 1990 can be seen below. It can be seen that pre-1939 unemployment rates and pre-1914 unemployment rates were far more volatile than the post-1945 period of modern macroeconomic management (Weir 1992: 323), and, above all, the period of Keynesian demand management from 1945 to the mid-1970s. 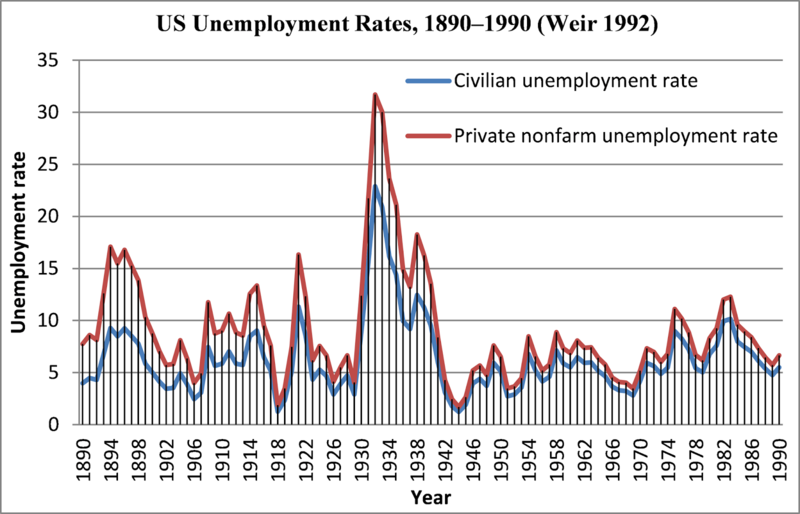 The greater volatility in the pre-1939 era can be seen very clearly in the private nonfarm unemployment rate. Although the 1890s has a lower unemployment rate than Lebergott’s older estimates, nevertheless the economic problems in that era and the protracted recession are seen in the high private nonfarm unemployment rate.